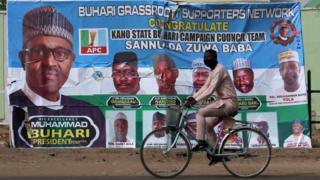 Nigeria’s President Muhammadu Buhari has been re-elected for a second four-year term. Africa’s most populous nation faces a range of problems including corruption, an economic slowdown and security threats. BBC Africa Editor Fergal Keane examines the challenges. This was never an election that promised the possibility of a new era. The 76-year-old president and his defeated rival, Atiku Abubakar, 72, have been around the Nigerian political scene for decades and represent two parties often associated with cronyism and corruption. Indeed Mr Buhari’s victory may in part have to do with public mistrust of his opponent who had to reject allegations of corruption during the campaign. The president did make some efforts in his first term to counter the graft which has seen tens of billions drain out of the exchequer. His personal financial integrity has never been questioned. But he has been widely criticised for not going fast or far enough. Will he be more vigorous in his second term? A dose of realism is needed: the breadth and depth of corruption is so great, it affects so many aspects of public life that making serious inroads into the problem would require a focus, energy and application that was lacking in President Buhari’s first term. His absence from the country for long periods due to ill-health – he sought treatment in London for a still undisclosed illness – gave the impression of an administration that often crawled rather than strode. President Buhari has been lucky in his choice of deputy. Vice President Yemi Osinbajo showed himself to be dynamic and brave when he stood in as acting president, notably reining in the security services and acting to stabilise the naira, the local currency, at a time of deep economic uncertainty. By contrast Mr Buhari has been nicknamed “Baba Go Slow”. It took him six months to appoint his cabinet first time around. The second problem he faces in fighting corruption is having the necessary political support. There is undoubted public backing but Mr Buhari’s party is compromised by senior members suspected of enriching themselves through graft. The fear is that across the board the looters will carry on pretty much as normal, undermining economic development. Economically the country remains dependant on oil prices for 70% of government revenues – a long-term vulnerability that helped pull Nigeria into recession between 2016-17. The World Bank has predicted sluggish economic growth: 2.2% for the coming year in a country with unemployment of more than 20% and nearly half the population living in extreme poverty. Ending the dependency on oil revenues needs to happen at a much faster pace. President Buhari also faces an array of security threats from clashes between farmers and herdsmen in the Middle Belt, continuing instability in the Niger Delta and – most worrying of all – a revived threat from Islamic extremists in the north of the country. There, the Boko Haram offshoot – Islamic State West Africa Provice (ISWAP) – used the elections period to stage a series of high profile attacks including an attempt to fire rockets into the city of Maiduguri on polling day. For a president at the height of his powers these would be a formidable array of challenges. But Mr Buhari is in his seventies with a history of health problems. It may be that he is rejuvenated by victory and his second term is more dynamic than the first. If not the danger is that Nigeria succumbs to the politics of drift with growing frustration among the young who make up more than half the population. For faith in democracy to endure those elected need to be seen to bringing tangible gains. This might – at least partially – explain why voter turnout was a record low of just under 35%, down from 44% in 2015. This is the statistic that should worry all political parties in Nigeria.